He describes Sirukizhangu (a seasonal root) as having the fragrance of first rain on dry earth. He laughingly informs me that sambar podi is not traditionally used in preparing sambar, but only in kozhumbu. And he gives simple tips such as boiling rather than roasting garlic if you don’t want the flavour to be overpowering. 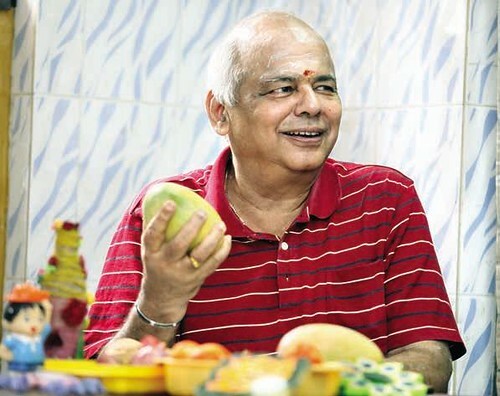 As his daughter, a passionate food blogger herself, rightly states, “He simply enjoys cooking and sharing recipes.” A Tamil Brahmin currently residing in Pune, Mr. G. Chandrasekharran (64) belongs to a family where men seem to enjoy cooking. We meet up to chat about traditional cooking, family bonding, seasonal vegetables and mango recipes as it is summer and mangoes are aplenty. Namaste Mr. Chandrasekharran. Your daughter, Rajmi, has spoken highly about your cooking. How did you develop this interest? I grew up seeing my father in the kitchen when my mother was unwell. He was an excellent cook and I remember how he would actively participate in temple cooking. Earlier, when there were festivals and puja in the temples, the community would come forward to do the cooking and not employ caterers. My father was always at the helm of these activities. At home, I often pitched in to help with the cooking and enjoyed it. I think I have been cooking right from my teens. My ancestors are from Tirunelveli, but I grew up in Chennai. I have lived there for over 5 decades. In 1999, I took voluntary retirement from Central Govt Service. After that I became the Vice-President in a software company. Recently, I retired from there and have moved to Pune to stay with my son. Do you cook even now? I don’t cook on an everyday basis but still cook quite often. Earlier, there were more reasons to cook such as when my wife went to her parents’ home during summer vacations. As we have always been a small family, if ever my wife needed a break or was unwell, I happily took over the cooking. What are the dishes you enjoy cooking? I like preparing sweet dishes such as Payasam (kheer) and Rava Kesari. My mother made excellent Mysore Pak and I have learnt that dish from her. However, what I cook more often are typical Brahmin recipes which comprise our everyday meal. Traditionally, our meal is a three-course meal consisting of steamed rice with sambar, rasam and finally ‘mor’ or buttermilk. This practice continues even now. We prepare many varieties of kozhumbus and side-dishes, but we do not use too much masala or spices in our cooking. Yes, most Brahmin cuisines, even from other states of India, are quite sattvik. That is true. The flavours are quite subtle. For instance, even though we add garlic to rasam, we do not roast it as it then has an overpowering flavour. If you boil garlic, then the flavour is not as strong. That’s a good tip. So when do you boil the garlic? We boil it separately and when it is well cooked, we add it to the rasam. Your daughter Rajmi is full of praises for your White Rasam. She calls it your signature dish. (laughs) It is quite simple actually. I used to experiment now and then when the children were at home. I have a son and a daughter. I prepare rasam with lemon juice and rasam powder. Once it is ready, the sediments settle at the bottom and what you will see on top is almost transparent. So we ended up calling it White Rasam. Otherwise, I have not deviated much from how my parents cooked. For instance, do you know that most Brahmins do not eat sorakkai (bottlegourd). For generations, many families have never eaten sorakkai. It is the same as how being a Jain, you may have never eaten brinjals. On the other hand, one of my favourite vegetable is sirukizhangu, a seasonal root that grows during November and December. It is very popular in my native village, Tirunelveli, and always reminds me of the first rain on dry earth. I am enjoying noting this down. Do you make masala at home or have you switched over to readymade powders? As far as possible, we don’t make a compromise on taste. So all powders, be it rasam powder or sambar powder, are prepared at home. However, we prepare sambar only with freshly prepared masala, which is the Araithuvittu Sambar. You mean you don’t use sambar powder for making sambar? That is a misnomer. Despite its name, sambar powder is not added to sambar but only to other kozhumbus. It is actually a kozhumbu podi. Interesting. So tell me, what is your daily routine like? I wake up in the morning and begin the day with morning puja and chanting along with my wife. Apart from the daily routine, I really enjoy spending time with my grandsons. I also surf a lot on the internet. My daughter Rajmi (Suvai Arusavi Blog) is a popular food blogger and we often discuss how we can make the recipes more interesting. And what recipes would you like to share today? I enjoy cooking with seasonal vegetables and fruits. If it was winter, I would have shared a recipe using sirukizhangu. Being summer, it can be a mango recipe. In my native place, we had a huge mango tree growing in our courtyard and made many varieties of pickles. So I can give you whatever recipe you like – be it raw mango rice, mango pickles or raw mango dal! Thank you, they sound delicious. Before you move on to the recipes, tell me, did you ever teach your children to cook? No, you cannot force anyone to learn cooking; there will be disasters. What is the requirement to become a good cook? There has to be an inner urge. Only then can a person excel and explore their creativity. You must allow children to find their own way in the kitchen. I learnt from my father and now my son also cooks quite easily and my young grandson keeps announcing that he is going to become a chef when he grows up. First published in July 2015 in Harmony – the Indian magazine for silvers for the column – ‘His Ladle Love’. A series about men who experience the joy of cooking and can weild a deft ladle in the kitchen. Part-2 of this post is the recipe of Maanga saadam and Maanga Paruppu, a family favourite.